Three UT stars (Kyle Russell, Jordan Danks and Preston Clark) are looking for their first regional championship. A couple of quick notes. 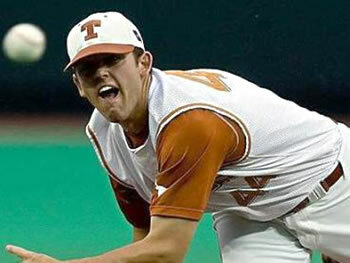 Texas signee Brandon Workman (rhp, Bowie HS) was drafted in the 3rd round of the 2007 MLB Amateur Draft. [tag]Kyle Russell[/tag] and [tag]Bradley Suttle[/tag] were drafted in the 4th round. They only got through the first 5 rounds of the draft yesterday; more Horns will be drafted today. Major League Baseball has changed their “draft and follow” rule. In the past, a team could draft a player and then take up to 51 weeks to sign him…and no other team could come knockin’ on the door during those 51 weeks. So, they could draft a player, encourage him to play another year of college ball, watch his progress, and then decide. All the while safe in the knowledge that if they wanted to sign the player, they had a year to do so. The new rule states that the teams only have until August 15th to sign a player, except for college seniors. I think the change will mean more draftees from the later rounds will go ahead and sign. But, maybe not. Some people think the rule change will mean that teams will draft fewer players. The draft goes 50 rounds. In the past, 4 or 5 teams would drop out as the draft got into the later rounds. But, most would draft all the way through to the end since teams had so long to evaluate talent. The new rule may mean they won’t bother drafting some players they would’ve drafted in the past. If I’m able, I’ll update this post as the draft progresses today. Update (2 pm). [tag]Randy Boone[/tag] was drafted in the 7th by Toronto; [tag]Adrian Alaniz[/tag] in the 8th by Washington; signee Taylor Grote (cf, The Woodlands) in the 8th by the Yankees; and signee Runey Davis (cf, Georgetown) in the 11th by Pittsburgh. Update (5 pm). [tag]James Russell[/tag] was drafted in the 14th by the Cubs; [tag]Joseph Krebs[/tag] in the 14th by Cincinnati; [tag]Chance Wheeless[/tag] in the 17th by Arizona; [tag]Nick Peoples[/tag] (as a second baseman, apparently) in the 19th by St. Louis; and signee Kevin Keyes (rf, Connally HS) in the 26th by the Rangers. Update (6 pm). [tag]Preston Clark[/tag] was drafted in the 33rd by the Cubs; [tag]Kenn Kasparek[/tag] (who was recovering from Tommy John surgery and did not play this year) in the 34th by Washington; signee Garrett Clyde (rhp, San Jacinto College) in the 43rd by the Cubs; signee Cameron Rupp (c, Prestonwood Christian Academy in Plano) in the 43rd by Pittsburgh; and [tag]Clay Van Hook[/tag] in the 45th by Seattle. Texas had a tough time of things last night as they lost the series opener to [tag]Missouri[/tag]. Missouri has proven to be a thorn in the Longhorns’ side for the last three years. Coming into the series, Mizzou had taken 6 of the last 9 games. The Tigers had also worked their way into 2nd place in the Big 12 as they came to town. So, the Horns couldn’t really afford to take things for granted. Things started out nicely last night as Texas took the lead 4-2, helped along by two home runs by [tag]Kyle Russell[/tag]. But, the Tigers took the lead in the 6th when they put 4 on the board as the Texas bullpen showed a crack or two. The Horns rallied, though, and tied things up in the 9th. Sadly, they gave up an unearned run in the top of the 11th as Preston Clark made a very rare error on a toss back to [tag]Randy Boone[/tag] that sailed over Boone’s glove. The Missouri runner at third base made a great decision and broke for home, scoring the go-ahead run. In the bottom of the inning, with two out, Texas rallied but the tying run was thrown out at the plate. Tommy Harmon made the decision to send the runner home and said afterward that he didn’t want to end the game with the tying run stranded at third base. He was hoping Missouri would make a mistake on the play. But, Missouri didn’t make a mistake. They won the game 7-6. The Horns bounced back today, though. In fine fashion. They got a great game out of [tag]Adrian Alaniz[/tag] who went 8.1 innings. He gave up one run on three hits while walking 2 and striking out 4. And, the bullpen did not let him down. [tag]Joseph Krebs[/tag] went in and struck out the final two batters of the game. 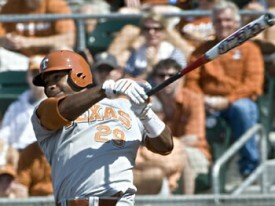 The Horns scored 2 runs in the 4th and 3 in the 6th to cruise to victory. [tag]Preston Clark[/tag] went 3-for-4 at the plate with a double and two runs scored. [tag]Chais Fuller[/tag] went 3-for-4 with a run scored and 3 runs batted in. Kyle Russell failed to hit any home runs today (“only” going 1-for-4) but that 1 hit pushed the final two runs across for the Horns. So, the series is even. Here’s hoping the Horns finish it off tomorrow. Austin Wood is expected to get the start. He’s done well lately and seems to be improving. This should be fun. For more details, you can check out the game reports I posted to my page. See yesterday’s game report or today’s game report.